Abbey Glen is a charming community in Gibsonville, North Carolina that provides carefree living and quality homes. Upon completion, the community will have 162 charming residences that include attached homes as well as detached single-family homes built by Epcon Communities. Residents of Abbey Glen enjoy a private clubhouse where they gather with neighbors, friends, and family. The clubhouse's great room is the perfect place to watch a game on the big-screen TV, play a game of billiards, or enjoy a cup of coffee from the kitchen. There is even a workout room to stretch and tone at your own comfort. Outside of the clubhouse, there is an outdoor pool to soak up the sun. Residents also enjoy walks and bike rides throughout the picturesque community trails. Abbey Glen is situated on 50 acres of rolling hills and provides a village-like setting. Epcon Communities built 162 homes in the Abbey Glen community. The majority of these are quad and duplex, single-level townhomes. There are also charming single-family homes in the community. These modern yet low-maintenance homes range in size from 1,140 to 1,995 square feet. Every home has at least two bedrooms, two bathrooms, and a two-and-a-half-car garage. Some homes have dens and courtyards or patios. There are many social events that happen throughout the year in Abbey Glen. Residents have organized a social committee to schedule exciting parties and club meetings. Residents gather at the clubhouse for game nights that consist of bunco, Mah Jongg, bridge, and canasta. Annual social events like Spring Fling, Oktoberfest, and holiday parties are fun events that residents look forward to attending. Abbey Glen is located in Gibsonville, North Carolina at the intersection US 70 West/South Church Street and Ashley Woods Drive. 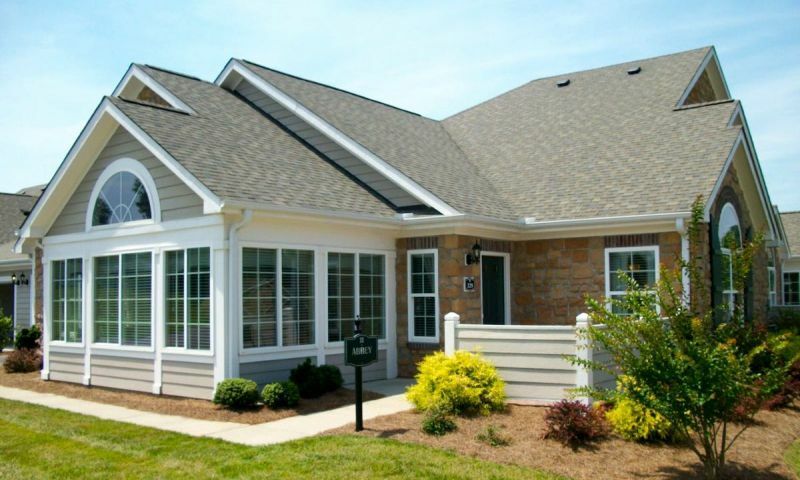 This pleasant community is conveniently located between the cities of Greensboro and Burlington. Its convenient location to US 70 West provides easy access to dining, grocery stores, retail shops, and churches within Gibsonville. Popular recreation destinations in the Greensboro Area include the Tanger Family Bicentennial Garden, Asheboro Zoo, and Oak Hollow Lake. When looking for a low-maintenance home in NC, look no further than Abbey Glen in Gibsonville. The attached at Abbey Glen are one-level duplexes and quads. They feature open living areas, generous bathrooms and attached garages. Homeowners can select a floor plan that ranges from 1,140 to 1,860 square feet in size with two bedrooms, two bathrooms, and an attached garage. Many models also feature a den for extra space. The single-family homes of Abbey Glen feature private courtyards, beautiful foyers, and open kitchens. There are three floor plans that offer 1,519 to 1,995 square feet of living space with two bedrooms, two bathrooms, and an attached garage. The quality, for some owners, does not live up to expectations.